His House Foundation is pleased to announce the opening of their new Abundance food program. This program complements existing food shelf programs by partnering with local restaurants, churches, bakeries, and grocery stores to rescue food, including prepared food. Food items are collected and redistributed to people in need. This helps families AND helps the environment as this food would be thrown away if it weren't for this program. 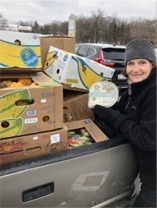 We are thankful to our Carver County partners as well as our food partners - we could not offer this program without your deep commitment and support.